I really enjoyed this book; I had seen bits and pieces of the movie with Kiera Knightley, so I had a small idea of what it would be like. However, as is almost always the case, the book is better than the movie I think. 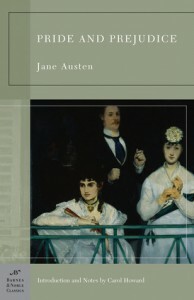 Jane Austen's characters are so deep and complicated; not necessarily something I expected.